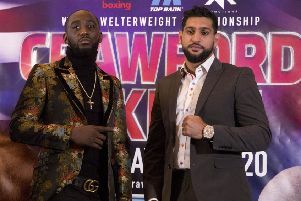 Tyson Fury has wound up heavyweight rival Deontay Wilder ahead of his clash with Francesco Pianeta at Windsor Park on Saturday night. Fury will continue his comeback with a clash against the experienced Pianeta, with WBC World chamnpion Wilder present at ringside in Belfast in his role as TV analyst. “If I come through this then Wilder has the chance to fight me - the lineal champion. Let’s face it, he’s not fought anybody,” Fury said. Pianeta, who was born in Italy but is based in Germany, has won all but five of his 40 fights, with Wladimir Klitschko, Ruslan Chagaev and Oliver McCall the bigger names on his record. “I study my heavyweights and I know he’s fought some good men. He’s a big strong fella and he knows that if he wins he will fight Wilder instead of me,” Fury said. “He’s going to try and knock me out. Hopefully he won’t be successful and we’ll put on a show. Fury made his comeback after two-and-a-half years out of the ring by overwhelming Sefer Seferi inside four rounds two months ago. “The old Tyson Fury is gone, never to be seen again in history. The new Tyson Fury is here now. “All I can promise is to put on a good fight,” said Fury, speaking at a press conference in Belfast. “I do want to win a world title again so I have to raise my game after three years out of the game nearly and ballooning up to 28stones. “To lose that weight has been mentally and physically draining and to do it there has to be a want in the brain and I have that.